It’s important to treat your employees right, and one of the best ways to show gratitude is by giving a meaningful gift to your employees. Handmade Damascus Knives are the perfect corporate gift to show appreciation for your employee’s hard work. Organizations have an obligation to treat their employees and reward them to keep morale high and company culture at its best. One way to do this is by giving meaningful gifts to employees to recognize their hard work and achievements. Often times corporate gifts can be cheap, impersonal, and have no meaning. To employees this can be taken as unimportant or even offensive if not rewarded for their hard work. One of the unique and best ways corporate gifts for employee’s is custom handmade Damascus steel knives. 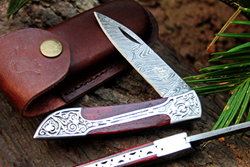 DKC Damascus Knives provides high quality knives that symbolize beauty and strength. High qualities knives are really a perfect gift for professionals, as they are memorable treasures that last a lifetime.